How we love the look of old wood floors! Those one-of-a-kind, character-rich beauties polished by generations of feet and mellowed by the experiences of daily living. These are floors that have withstood the test of time in both durability and style. Wood as a flooring option was first seen in the U.S. about 200 years ago. With the abundance of dense forests, early settlers had a readily available and inexpensive building material for their homes. Wide planks (8 to 15 inches) were installed in rooms with heavy traffic, while narrow strip (2 to 4 inches) floors – which involved more labor – were reserved for “better” rooms, such as those where guests were received. Before the age of steam-powered machines, boards were milled by hand. Tight-grain, old-growth pine was easy enough to work with. After joining rough-hewn planks to floor joists with wooden pegs or the rare iron nails, craftsmen used chisels to carefully scrape and carve a smooth, straight floor from unfinished lumber. As skilled as they were, though, they couldn’t achieve perfection, and new floors bore the subtle markings of their chisels and saws. Those early wide-plank floors were left unfinished, eventually ripening to a warm, pumpkin-hued patina with undulating patterns created by the traffic patterns of the residents. That distinctive look of hand-scraped floors is no longer a vision from the past. The texture, richness and character that you thought were nearly impossible to capture – the old-wood floor look created by time and nature – are available today as hand-scraped hardwood flooring. These authentic hand-scraped hardwood floors are gently carved and beveled with scooping, dents, wear patterns and rustic character markings by today’s skilled craftsmen. Each board has a perfectly aged feel; each board brings its own distinctive character to a floor. Today’s hand-scraped hardwood floors are available in sizes from narrow strips to wide planks to mixed width planks. And you can choose from a wide range of wood species like maple, hickory, walnut, birch, cherry, even exotic acacia, a renewable species prized for its rich grain tones. Unlike the hand-scraped floors of yesteryear, these floors come with a durable finish to preserve that one-of-a-kind look. Plus routine cleaning and maintenance have never been easier too. 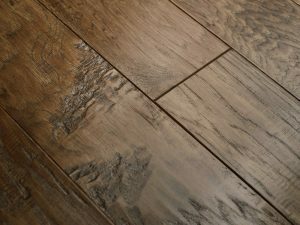 More and more homeowners are falling in love with the rustic charm of old flooring and the unmistakable look that no machine can match. Fortunately, we do not have to travel back in time to get it!